If you’re anything like us, you’re always looking for ways to improve your website. For example, you’ll want to ensure that your site always runs fast, regardless of the number of visitors it receives. Failing to optimize your site’s speed can have dire consequences, such as higher bounce rates and lost income. Fortunately, speeding up your site doesn’t have to be difficult, especially if it’s hosted with DreamPress. More often than not, you will only need to perform a few simple tasks to fully optimize your site. Even if you’re no web wizard, you can still guarantee that your site will run fast and smoothly. In this article, we’ll start by discussing the importance of having a fast site. We’ll also cover 10 methods you can use improve the speed of your DreamPress website right now. Let’s get started! As you might know, we’ve discussed the importance of website speed many times before — with good reason. If your site is suffering from slowdowns, it can both negatively affect your users’ experience and harm your business financially. The fact is that most internet users have come to expect sites to be fast, and when they’re faced with long loading times, they’re more likely to leave before performing any actions. The number of visitors who leave this quickly is referred to as your site’s bounce rate and is something you’ll want to minimize. A site suffering from slow speeds is also likely to see fewer conversions and even a loss in profits. As such, the importance of speeding up your website should be evident. However, to do this, you’ll first need to know how well your site is currently performing. It’s a smart idea to regularly test your site to see how quickly it loads and how well it manages increases in traffic. Even if you’ve optimized your site for speed in the past, it may have slowed down over time, so you’ll want to stay up-to-date with its performance. Fortunately, testing the speed and performance of your site is much easier than you might expect. In fact, there are plenty of solutions you can use to do this right in your browser. Pingdom is a free tool that lets you enter the URL of the site you want to test and select a server location. You can then run a test, which will usually take less than a minute. Once that’s done, you can see how quickly your site managed to load from the specified server. Your site will get an overall score, and you’ll see how it compares against other sites. In this case, the tested website was faster than 37 percent of other sites and was given a ‘C’ score. That means this site could definitely use some optimization. It’s a smart idea to run this test a few times and to use a variety of servers. 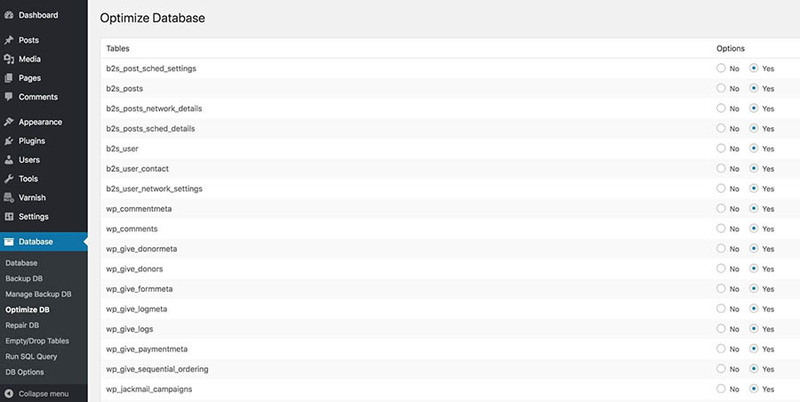 Best of all, Pingdom’s results will even point out specific areas where you can optimize your website to make it faster. Once you’ve tested your site and found areas where it could improve, you can get to work. In this section, we’ll look at ten of the ways you can diagnose why the site is slowing down and how you can optimize it for speed. Before we get started, we should mention that one of the factors in your site’s performance is its hosting plan. An optimized, WordPress-specific plan such as DreamPress will do a lot to keep your site fast and stable. However, that doesn’t mean the following methods can’t improve its performance even further. Let’s jump right in! Caching plays a vital part in making sure your site loads quickly, which is something we’ve covered in our complete guide to caching. The good news is that all DreamPress sites include built-in caching already, so you don’t need to worry about installing a solution yourself. However, even with DreamPress’ caching functionality, you’ll still need to manage your site’s cache from time to time. You can do this with the Varnish HTTP Purge plugin. This plugin is included on all DreamPress sites, and it automatically clears your cache when you post new content. As such, it prevents your site from displaying outdated files to visitors. Varnish HTTP Purge also includes a tool to test your caching so you can make sure it’s working correctly on your site. You can access this option from Varnish > Check Caching. Here, you can enter a URL for a page on your site to test its caching status. The result will show any errors, and highlight if your theme or plugins are causing problems with the cache. You can now go through these results to find areas that conflict with your cache. For more information, see our guide to managing the DreamPress cache. In a nutshell, most code is written not just to be functional but also to be easily readable by humans. This results in excess information that isn’t strictly necessary. By minifying the code, you can keep the functionality intact but make it much faster for computers to read and run. Several plugins can help you do this. 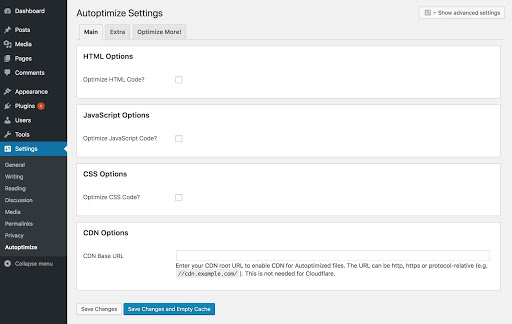 For example, Autoptimize will automatically ensure that the scripts on all of your pages are optimized. What sets this tool apart from many other minification plugins is that it also optimizes wp-admin. All you need to do after installing and activating the plugin is navigate to Settings > Autoptimize. Your site likely contains a fair amount of images, which is great for your site’s look but can be a real problem with it comes to loading times. Many image files, particularly if they’re physically large or high-quality, can be very heavy. This is a common cause of slowdowns. To avoid this issue, take care to optimize and compress images. This will severely cut down on file sizes. There are several browser and downloadable tools you can use for this, such as TinyPNG, which also compresses JPG files. However, to make things even easier, you can install an image compression plugin. This will automatically decrease the size of any images you upload, including their thumbnails. You can even set the level of compression you want. One such plugin that we have recommended in the past and still favor is ShortPixel. ShortPixel is very easy to use and offers bulk optimization of your existing images. You even get a certain number of free optimizations every month. This makes it an excellent choice, particularly if you want a quick plug-and-play solution. Another way you can improve your images is by implementing a ‘lazy loading’ solution. With this feature in place, only images that are currently visible on the screen will be loaded. That can help to speed up your pages, particularly if they contain a large number of visuals. As you might expect, there are a number of tools available to help you implement this functionality. For example, the popular Jetpack plugin contains a lazy load feature for images. There are also dedicated plugins, such as the aptly-named a3 Lazy Load. This plugin is a simple yet powerful option. It will ensure that all images (including avatars, thumbnails, and those inside widgets) are only loaded when a user scrolls down to their locations on a page. Another handy alternative is Crazy Lazy. While this plugin features most of the same functionality, it is very lightweight and easy to use. Regardless of which option you choose, you should find that image-heavy pages will be faster and easier to navigate as a result. While plugins are incredibly useful for customizing and expanding your site’s functionality, some can hurt its performance. If your site is starting to slow down, a good place to start diagnosing the problem is by checking plugins. Some plugins can hog a lot of server resources or simply take up too much space. If you’ve recently added a plugin to your site, try disabling it to see if that helps bring your speeds up. You should also see if any of your plugins have been recently updated, which could be a cause of the problem. Plugins can also interfere with your site’s caching, which we discussed earlier. To find out if this is happening, you can try running a caching test with Varnish HTTP Purge to see if it finds that one or more plugins conflict with your cache. If you find that a plugin is the root of your performance problems, you may want to look for a more lightweight alternative. It might also be worth reaching out to the plugin’s developers, as the performance issues may be due to a bug they’d like to be aware of. When you choose a theme for your site, you’re most likely focusing on its appearance and features. However, this could result in picking a low-performance theme that drags down your site. As such, you should always check a theme’s user reviews first to see if other people have encountered speed issues. 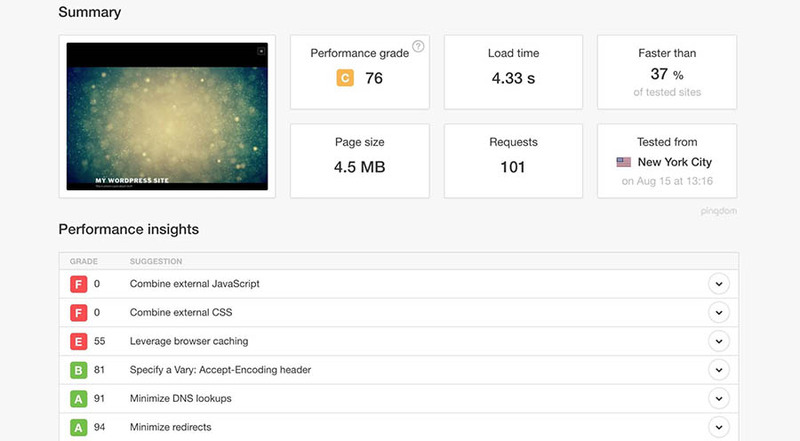 You can also test to see if your theme is slowing down your site. This can be done by temporarily replacing it with one of your site’s default themes. 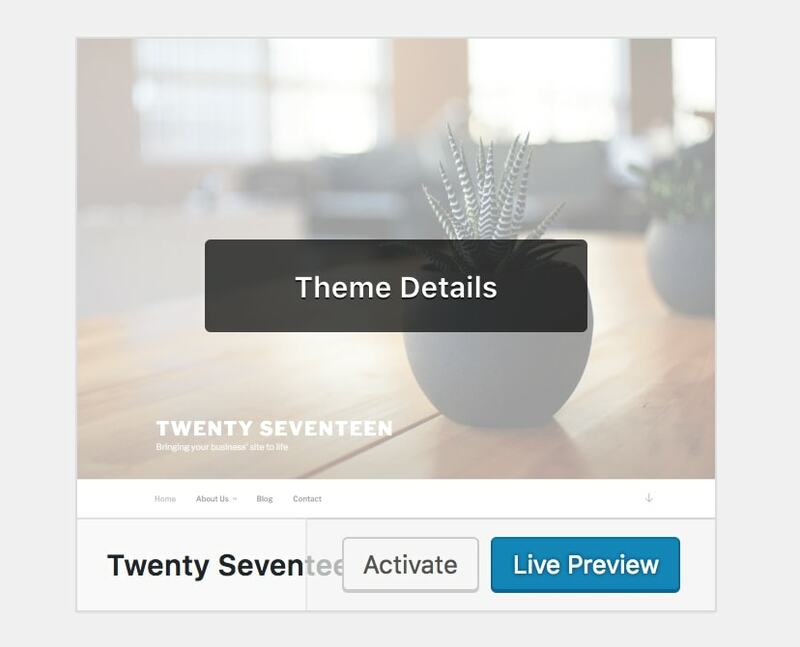 Just access Appearance > Themes, and click on Activate next to one of the basic WordPress options. Now, test your site’s speed again to see if you notice a significant difference. If so, you may want to look for a more optimized theme as a replacement. Finally, you should also try to find a theme that supports Accelerated Mobile Pages (AMP), as this will help boost your site’s speed on phones and tablets. This is incredibly important since many of your users will be visiting your site using mobile devices. One element that it’s easy to forget about is your site’s database. While this is a vital component of every site, you rarely have to worry about it. However, if you leave your database alone for too long, it can fill up with old or unnecessary data, causing slowdowns as a result. The best way to avoid this, especially if you’re unfamiliar with databases, is to use a plugin. In this case, we recommend WP-DBManager. This is an all-in-one database solution that can repair, back up, and optimize your database. To do the latter, just navigate to Database > Optimize DB. Select all the data tables you want to include and then click on Optimize. It’s a good idea to do this regularly (at least once a month) to make sure your database is always in top shape. Another possible cause of slow loading times is missing files or broken links. For instance, if a server is trying to locate a particular file to no avail, it may be using up precious resources for nothing, hampering your site’s performance in the process. These missing files are usually known as 404s, since they often result in the “404 Not Found” error. There are several common files that can be affected by this problem, such as your site’s ‘favicon’ (the icon that appears in your browser next to your site’s name), your robots.txt file (a file that enables you to exclude specific areas of your site from search engines), and your sitemap. These missing files and broken links can affect your site negatively in many ways. For one, it doesn’t look great to a visitor if parts of your site just aren’t there or your links don’t work properly. Plus, as we mentioned, performance can also suffer as a result. As such, you’ll want to make it a habit to check your site for broken links regularly. One plugin that can help you accomplish this is Broken Link Checker. This is yet another plugin that does most of the work required automatically, without much input needed from you. In short, it will check for broken links and 404 errors across your site and notify you via email or on the dashboard when any issues are found. You can even edit links directly from the plugin’s tab, sparing you the potential headache of having to manage multiple broken links individually by editing the pages yourself. This plugin is a useful solution and is particularly helpful when it comes to large sites with hundreds (or even thousands) of pages. Another reason your site can slow down is due to a sudden increase in traffic. Sometimes this is perfectly natural, for example, if one of your posts has gone viral and draws a lot of new visitors to your site. However, it could also be due to more malicious causes, such as a Distributed Denial-of-Service (DDoS) attack. To prevent these attacks, you’ll want to make sure that your site is secure. You’ll also need a way to see if there are particular areas of your site that are receiving more traffic than you would expect. These could represent a potential security vulnerability that attackers are attempting to exploit. Using a tracking solution like Google Analytics can be very helpful in keeping an eye on your site’s traffic. When someone visits your site, its files usually travel to them all the way from your host’s server. This is true regardless of the visitor’s geographic location or the number of other visitors currently using your site. As you can imagine, this can be quite strenuous for one server to handle, which can lead to longer loading times. The best way to fix this is to use a Content Delivery Network (CDN). A CDN is a network of servers that are spread across the world and all contain copies of your site’s files. This means that when a user accesses your site, its files will be sent from the CDN server closest to them. A CDN minimizes delays due to geographic distance and also spreads the strain across multiple servers. There are a huge amount of CDN solutions for WordPress, each with their own advantages. 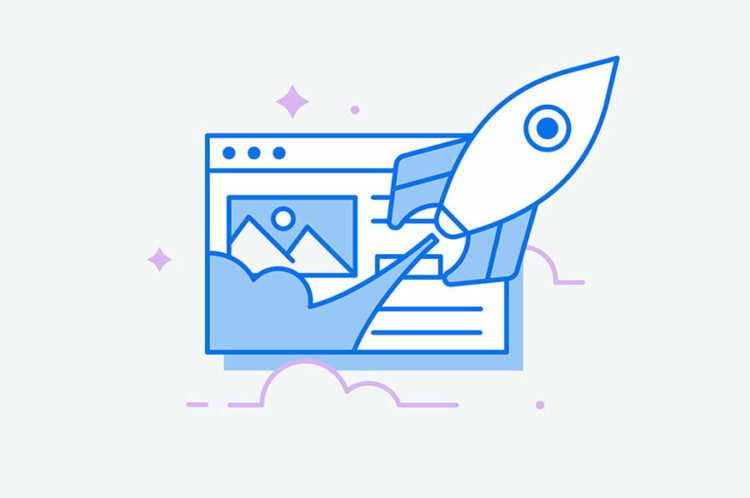 For example, the popular Jetpack plugin includes a CDN for image files, which can help speed up your site. Jetpack Professional, which is included with the purchase of a DreamPress Plus or Pro hosting plan, also includes a CDN for video. Last but by no means least, we come to the oldest trick in the book. You’ve doubtless heard this repeated time and time again — including from us — but it’s for a good reason. If you don’t keep your WordPress installation, plugins, and theme updated, they can quickly become sluggish and may cause a number of other problems. Not only can failing to perform regular updates lead to significantly worse performance, but it can also leave your site vulnerable to security issues. 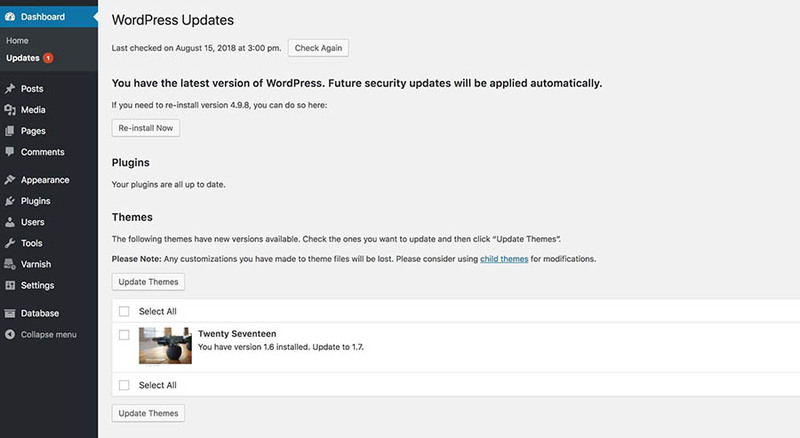 Fortunately, WordPress makes updates easy. They’re always clearly highlighted in your admin area, and you can find them under Dashboard > Updates. Here you’ll see if there’s a new version of WordPress or any updates are available for your themes or plugins. You should make sure to check this page regularly to ensure that your site is optimized. Of course, don’t forget to back up your site and consider creating a staging site for testing updates before they go live. Speed is one of the most critical elements of a successful website. After all, if a site takes forever to load, very few people will bother to stick around and see the actual content. As such, making sure your website is fast is a top priority. As luck would have it, doing this isn’t even all that difficult. Do you have any questions about speeding up your DreamPress website? Join the conversation in our DreamHost Community!